The McGill Aerospace Design Society (AERO McGill) is a shared platform for all aerospace engineering design teams at McGill.The McGill Aerospace Design Society was organized by a group of McGill undergraduate students passionate in aerospace design to give fellow colleagues the opportunity to “get their hands dirty” with various aerospace projects in a collaborative environment. McGill University offers an undergraduate concentration in Aeronautical Engineering and a Master’s program in Aerospace Engineering, and the Engineering faculty conducts ground-breaking research in collaboration with the vast Montreal aerospace industry. There are over 40 faculty members at McGill concentrating on aerospace-related research with over $20M per year in aerospace research programs and over 4,500 students in the Faculty of Engineering at McGill. AERO provides our fellow students with an inclusive learning environment about aircraft design, allowing members to apply in-class theories in real-life such as fluid mechanics, computational aerodynamics, and aircraft performance, stability, and control. 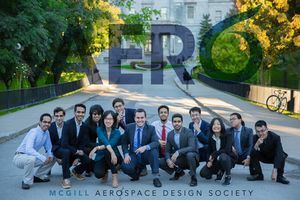 The McGill Aerospace Design Society (AERO) provides the organizational frameworks, mentoring, and tools, as well as 100% of the funding for design teams that we accept in our society. All design teams bear the Aero McGill’s branding, projecting a unified and collaborative image to the McGill community at large.The McGill Aerospace Design Society (AERO) is a shared platform for all aerospace engineering design teams at McGill. We provide the organizational frameworks, mentoring, and tools, as well as 100% of the funding for design teams that we accept in our society. One reason for the previous lack of aerospace design teams was the difficulty in starting a new team from scratch. With the McGill Aerospace Design Society, students interested in starting a new project can skip the process of starting and promoting a team, acquiring initial funding, gaining official status at McGill, and finding resources for design, manufacturing, and testing. This shortcut gives design teams more time designing their actual projects. We hope to expand the current group of design teams to include the AIAA competition in the future, as well as any other stimulating challenges that are brought forth. All design teams bear the AERO branding of the McGill Aerospace Design Society, projecting a unified and collaborative image to the McGill community at large. At Aero McGill we encourage the development of professional and engineering skills that match industry standards to cultivate a learning experience that extends beyond the reach of any classroom. This year AERO teams will be competing in three different competitions – two featured from the SAE Aero Design East Series and one from Unmanned Systems Canada. In 2019, AERO McGill will be competing in the 2019 SAE Aero East Design Series in the Micro Class. 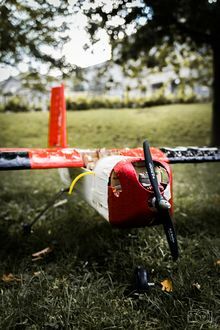 The objective is to design, build, and assemble a lightweight, hand-launched, remote-controlled, and fixed-wing micro UAV. Points are earned for carrying heavy payloads while minimizing the weight of the aircraft. In 2015, AERO McGill participated in this competition for the first time and placed 16th overall - ahead of many teams competing for five years or longer. Following our goal of continuous improvement, we placed 3rd in design and 8th overall in 2016 - a commendable feat for a new team. In Fall 2017, a new team has been working on producing a non-competition solar powered aircraft. The McGill Solar Drone team has started the development of a prototype solar-powered unmanned aerial vehicle (UAV) drone capable of high speed agricultural surveillance. The prototype focused on the wing for 2017-2018 in order to get the drone airborne. This year, the team focuses on developing a fuselage well suited for the mission objectives and is aiming to manufacture a remotely-controlled aircraft capable of extended flight for large-scale surveying. This project will be made possible by an array of solar panels spanning the wings providing constant power to a high energy density battery. In 2019, AERO McGill is planning on competing in the Advanced Class of the SAE Aero Design Series once again. The objective is to design, build, and operate a remote controlled aircraft to drop a variety of payload, including fully autonomous gliders, on target in a designated drop-zone. Points are earned for accuracy of the drop and maximum payload lifted. In 2016, the team participated in this competition for the first time, and placed 8th overall. The team was able to both successfully fly and drop the packages on targets. In 2017, we placed 9th overall due to an unfortunate crash early in the competition, followed by a similar fate in 2018. Renewed by these failures, the team has made major changes in design and is attacking the new ruleset of 2019 with vigour. In 2019, AERO McGill will compete in the Unmanned Systems Canada competition from May 3rd to 5th at Alma, Quebec. The objective is to design, build, and operate an autonomous fixed-wing or multirotor aircraft. The competition’s scenario is changed annually. This year, the team’s mission is set in a damage assessment scenario. Tasks include Beyond Visual Line of Sight (BVLOS) survey, detailed inspection, and payload delivery. The vehicle is limited to a gross weight of maximum 10 kg (22 lbs) and must be capable of autonomously completing a variety of ground oriented tasks such as terrain mapping and target analysis.